My second pizza of the night was planned with Jimmy in mind and his love of meat on pizza and anything spicy. One of my favorite parts about cooking is taste testing as I go along. The chorizo sausage I bought had a little kick to it when I taste tested it after it was done cooking. I spread sauce on the dough, sprinkled on a mixture of sharp cheddar and mozzarella cheeses, then topped that with the chorizo and sautéed peppers and onions. Sometime in between the taste test and eating the actual pizza, the chorizo lost its kick. The pizza still tasted great though and Jimmy left our house full on pizza. 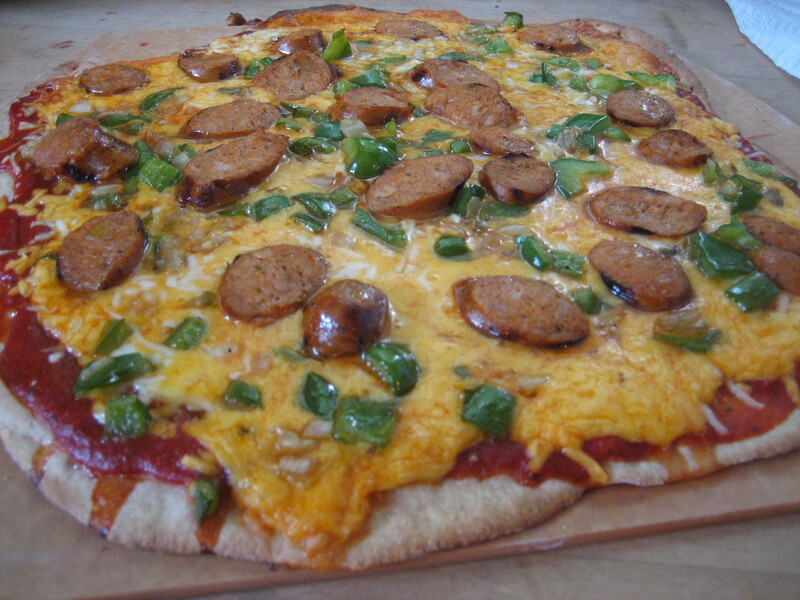 This entry was posted in cheddar cheese, cheese, chorizo, marinara, meat, mozzarella, Onion, peppers, sauce, veggie and tagged cheese, chorizo, chorizo pizza recipe, pizza. Bookmark the permalink. The kick loss probably has something to do with osmosis or something… the crossage* of a semi-permeable membrane from a place of higher concentration to a place of lower concentration… maybe the spices in the chorizo crept out into the general pizza milleau. It’s happened to me with olives in chili. The taste test… awesome… but the finished product? The olives just tasted like lumps. Still, it sounds like a great combo of stuff!